For years, anti-reproductive rights groups have targeted Black communities with specific campaigns to build opposition to abortion rights. For example, in 2011, the Atlanta-based Christian group The Radiance Foundation erected 50 billboards around the city reading, “The 13th amendment freed us. Abortion enslaves us.” So far in 2016, there’s been a trend of politicians co-opting the language of Black Lives Matter to the same end. In January, Wisconsin Representative Sean Duffy criticized Congressional Black Caucus members for being pro-choice, saying they were failing to “defend the downtrodden.” Meanwhile, a Missouri state representative introduced the “All Lives Matter” bill, which would grant fetuses personhood. To counter that co-optation, leaders from Black Lives Matter, Trust Black Women, and New Voices for Reproductive Justice teamed up last week to make clear how reproductive rights and racial justice are intertwined. “We work to counter the growing anti-abortion movement in the African-American community and defeat race- and gender-based campaigns and legislation that limit abortion access for Black women,” said Trust Black Women in a solidarity statement co-signed by 25 other Black-women-led reproductive justice organizations. “Time and time again, politicians have tried to divide communities over these issues,” said Trust Black Women director Monica Raye Simpson on a phone call accompanying the statement’s release. “We’re not fooled by any of this. It’s definitely insulting to us as Black women and we’re not going to let it work.” Looking forward to the 2016 election, Republicans in state and presidential races are sure to keep attacking both reproductive rights and racial equity issues. The divisive rhetoric of election season makes the need for strong coalitions even more valuable. Black Lives Matter co-founder Alicia Garza noted on the call that reproductive justice and racial justice organizing are linked in many ways. People often think of reproductive rights as being just about access to birth control and abortion, but it’s bigger than that, said Garza. “It’s not just about the right for women to be able to determine when and where and how they want to start families. It’s about our right to be able to raise families, to be able to raise children who become adults,” said Garza. Police violence, poverty, and lack of access to healthcare collude to make it hard for Black families to see their children into healthy adulthoods. 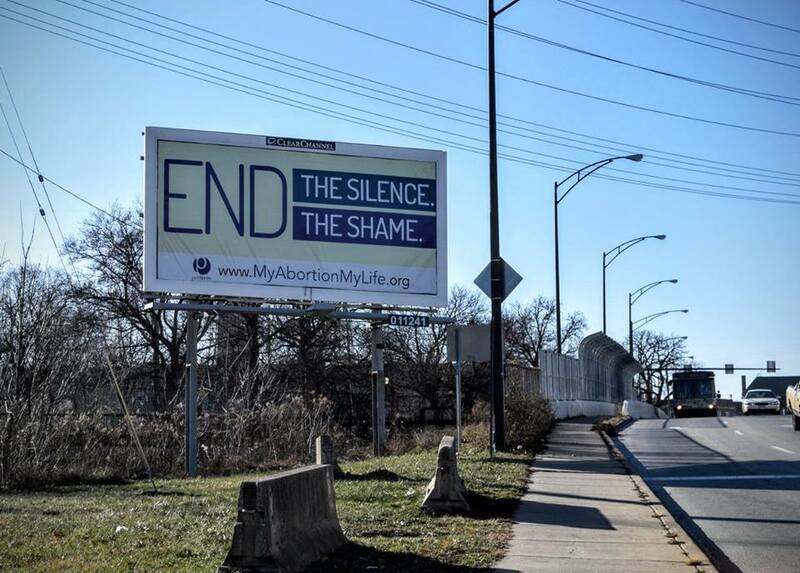 A pro-choice billboard that went up last year in Cleveland. Isabelle Boni-Claverie's documentary looks at the role anti-Blackness plays in France.